Give your child a healthy mental math workout with this colorful worksheet adorned with cheerful piggy banks. He'll learn his addition facts as he practices two-digit addition and figures out how much money the piggy banks hold. For further practice, see the other worksheets in this series. Kids will solve two-digit addition problems in this piggy-bank math worksheet. Find out how much money is in each piggy bank through addition. Find out how much money is in the bank with this two-digit addition piggy bank worksheets. Use mental math to solve addition problems in this math worksheet. Solve two-digit addition problems in this piggy-bank-themed worksheet. Use your math skills to figure out how much money is in each piggy bank. Kids will do two-digit addition problems to find out how much money is in each piggy bank in this worksheet. Practice math skills with this worksheet. Use mental math to work through two-digit addition problems in this math worksheet. Kids will solve to find out how much money is in each piggy bank. Don't break the bank! Can your second grader use double-digit addition to determine how much money is in each of these piggy banks? Use this piggy-bank math worksheet with your young mathematician. Find out how much money is in each piggy with double-digit addition. 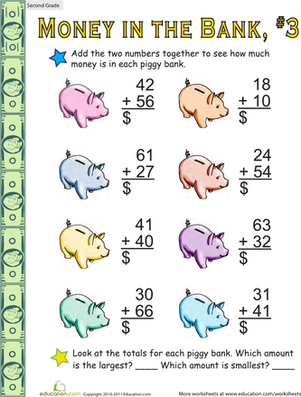 Use this piggy bank math worksheet to practice two-digit addition. Try this math worksheet with your child. This piggy-bank-themed worksheet will help your little mathematician practice two-digit addition. Try this addition worksheet with your child. How much money is in each piggy bank? Give your second grader practice with double-digit addition as he gets more familiar with mental math.